The great German polymath Gottfried Leibniz (see biography of Leibniz) was one of the first men (after Ramon Llull and almost at the same time with Athanasius Kircher), who dreamed for a logical (thinking) device. We have to mention also the fact, that Leibniz created the first mechanical calculator, suitable not only for addition and subtraction, but for multiplication also—the Stepped Reckoner. But being an authentic genius and extremely powerful intellect, Leibniz made a huge step forward. 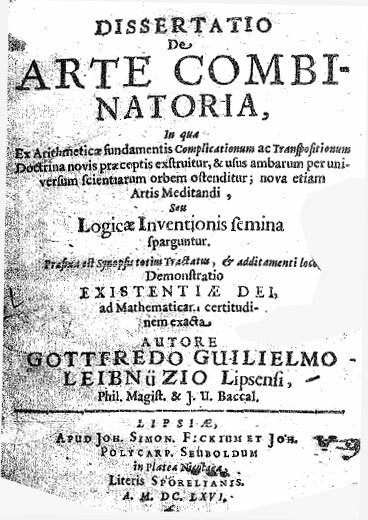 In 1666 Leibniz published his first book (see the upper image of the title page), also his habilitation thesis in philosophy, Dissertatio De Arte Combinatoria (On the Art of Combinations), partly inspired by the Ars Magna of Ramon Llull (Leibniz was still a teenager, when he encountered the works of Ramon Lull). Though the design Leibniz places at the front of his book (see the lower figure) appears to be a very simple and even trivial diagram, compared to the copperplates of Kircher's books, the entire text which follows speaks a new and different language. Leibniz was only 20, but he analyses as an advanced mathematician the potential power and limits of the art of combination. 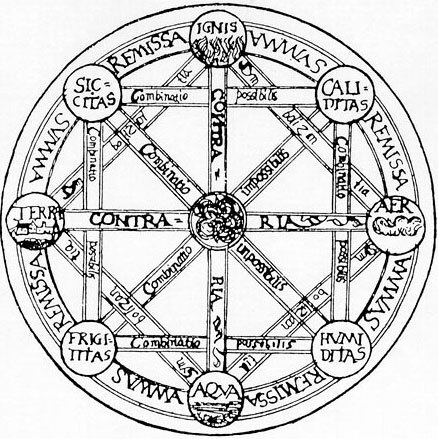 In contrast with Llull and Kircher, Leibniz was not at all interested in any esoteric applications of this method, but rather in a way of reproducing the totality of the universe within one science. After reading his very famous treatise on the monads (Monadology from 1714) (monads are something like atoms, situated in the metaphysical realm) as a model for the art of combination, his new, radical perspective is at once comprehensible. In 1674 Leibniz described a machine for solving algebraic equations. A year later, he wrote comparing logical reasoning to a mechanism, thus pointing to the goal of reducing reasoning to a kind of calculation and of ultimately building a machine, capable of performing such calculations. "My invention contains the application of all reason, a judgment in each controversy, an analysis of all notions, a valuation of probability, a compass for navigating over the ocean of our experiences, an inventory of all things, a table of all thoughts, a microscope with which to prove the phenomena of the present and a telescope with which to preview those of the future, a general possibility to calculate everything. My invention is an innocent magic, a non-chimerical Cabbala, a writing, which everyone can read and which everyone can very easily learn..."
Quite a pathetic proclamation, but that was the style of the great philosopher! 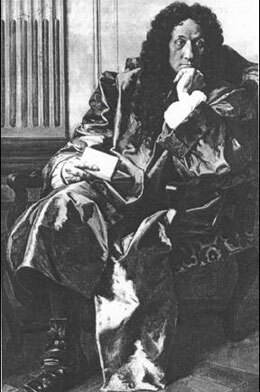 Leibniz apparently believed, that he have invented a general problem-solver, like those in the computer sciences have always dreamed of. But of course, his whole super-ambitious program was not to be realized. Only some aspects of that proclamation were really transposed into useful applications. At first, Leibniz made a few essential steps toward the calculation of probability, which is obviously a very important problem for all so-called expert-systems, and artificial intelligence in general. He then attempted to transcribe the whole art of combination into a system of formulas because he wanted to calculate every single part of the process, each step and each result of an interval. Thus he used consequently his mathematical skills to produce a new kind of combination by transposing meanings into figures and values. Even more—Leibniz was also one of the first men, who realized the importance of the binary system (Of course, he is not the inventor of the binary system. Pingala, an otherwise-obscure Indian author, wrote about 300 B.C. the Chandahsastra, or Science of Meters. In hid treatise, he uses a binary logic system (short-long, in this case, rather than 0-1) to explore meter in poetry.) Leibniz discovered that computing processes can be done much easier with a binary number coding (in his treatises De progressione Dyadica, 15th March, 1679 and Explication de l'Arithmetique Binaire, 1703). 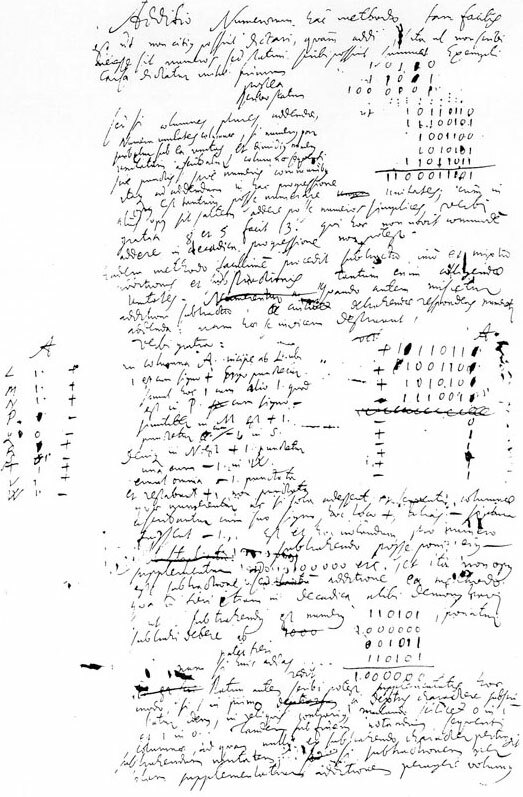 In these clear and lucid treatises (in the lower figure is shown the second page of the original manuscript "De Progressione Dyadica"), Leibniz analyzed the possibilities of the binary system and, demonstrating its four fundamental operations of calculation—addition, subtraction, multiplication and division—he expressed the conviction that one day in future the machines would use this system. Though hard to believe, in his 3-pages treatise De progressione Dyadica, Leibniz even outlines a calculating machine which works via the binary system: a machine without wheels or cylinders—just using balls, holes, sticks and channels for the transport of the balls—This [binary] calculus could be implemented by a machine. The following method would certainly be very easy to be implemented. [A machine with] holes, which can be opened and closed. They are to be open at those places that correspond to a 1 and remain closed at those that correspond to a 0. Through the opened gates small cubes or marbles are to fall into channels, through the others nothing to fall. It [the gate array] is to be shifted from column to column as required for the multiplication. The channels should represent the columns, and no ball should be able to get from one channel to another except when the machine is put into motion. Then all the marbles run into the next channel, and whenever one falls into an open hole it is removed. Because it can be arranged that two always come out together, and otherwise they should not come out. Another remarkable idea of Leibniz, announced in his February, 1678, essay "Lingua Generalis", was connected closely with his binary calculus ideas. Leibniz spoke for his lingua generalis or lingua universalis as a universal language, aiming it as a lexicon of characters upon which the user might perform calculations that would yield true propositions automatically, and as a side-effect developing binary calculus. Leibniz was indeed a great inventor, in spite of not realizing his dream of inventing the general problem-solver. This was impossible with the knowledge and technology, available at his time. To my mind, if we have to appoint the two greatest persons in the history of computers, first definitely will be Gottfried Leibniz, side by side with Charles Babbage.